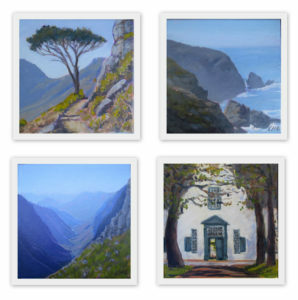 Four landscapes exhibited at the Tiny Treasures Exhibition at the ArtB Gallery, Bellville, in July. Each one is 20 x 20 cms and are painted in oil on canvas. This is an annual event organised by the Belville Art Society as a fundraiser. There were many beautiful little works on the exhibition.